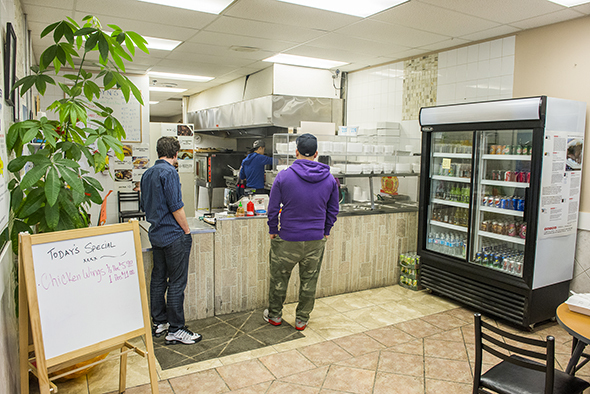 Allwyn's Bakery may not look like much from the outside, but this takeout spot, found in an unassuming North York-area strip plaza, doles out delicious and budget-friendly meals. 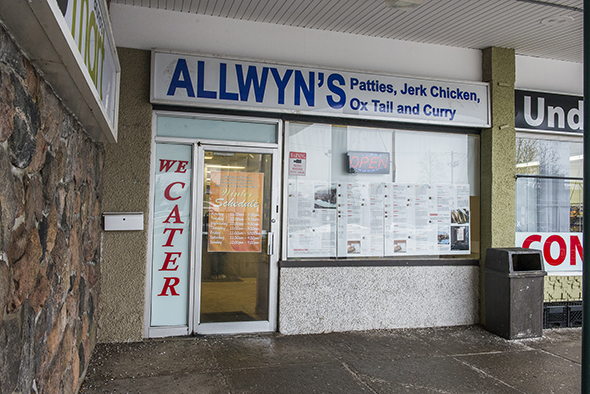 Allwyn's moved locations about a year and a half ago, but regulars still drop by (sometimes daily) to pick up quick and filling jerk chicken sandwiches and patties. Patricia Li tells me her father-in-law C.K. 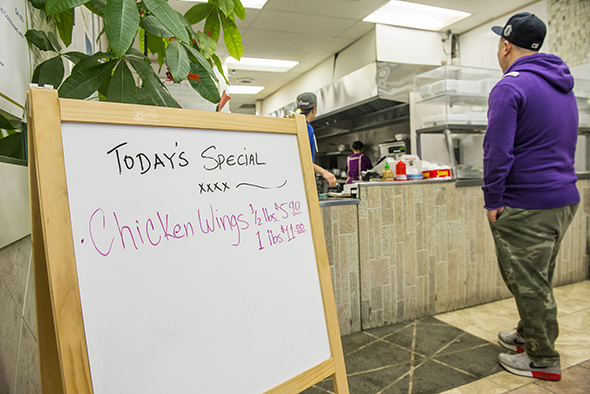 Chung started the place along with a Jamaican chef almost 20 years ago. "He taught us how to start up this business," says Li. 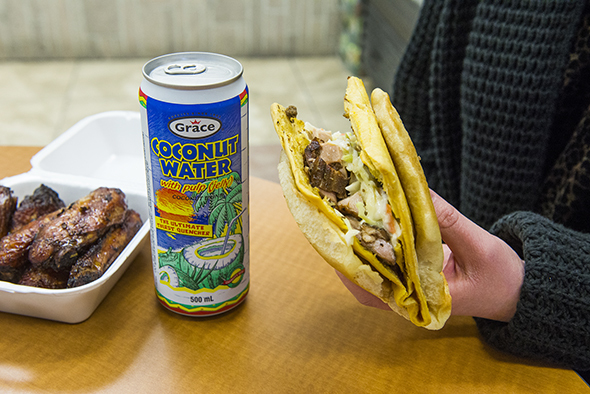 Allwyn's makes its jerk sauce from scratch and bakes up its own beef patties and coco bread at an off-site facility in Scarborough. Perhaps that's why Allwyn's has developed such a local following - their old location was near a few high schools, so that helped too. Li says her father-in-law still sees customers who started dropping by when they were teenagers. "He's literally seen a lot of people grow up." I try a jerk chicken sandwich on coco bread ($4.60) with creamy coleslaw and also snag a bite of my friend's beef patty sandwich, which comes stuffed with jerk chicken and coleslaw. The jerk chicken has a nice bite to it, but it's not overwhelmingly spicy - I kick it up a notch with the house made habanero hot sauce. 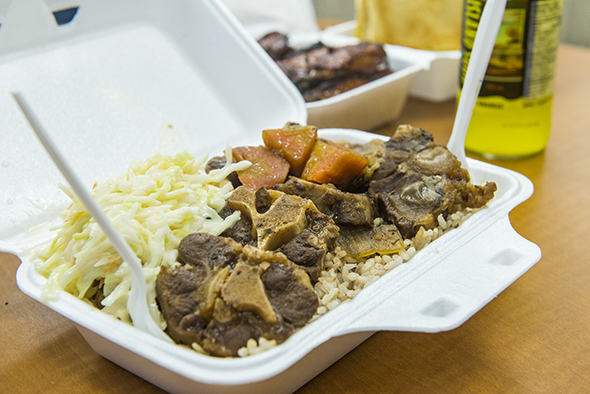 We also share a large serving of oxtail with rice and peas ($11.50). It's a hearty and savoury dish that I can't stop picking at. 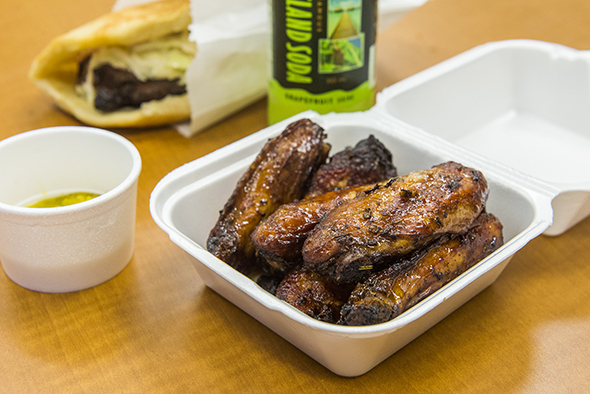 Li serves up a half pound of jerk-flavoured chicken wings ($5.90) fresh from the oven - they're our dessert. They come out piping hot and with crispy skin despite never seeing the inside of a deep fryer. We eat at the lone table in the centre of the restaurant, which is dotted with large printouts from the restaurant's stellar online reviews. A steady stream of customers pop in for takeout and Li and her staff seem to be on a first name basis with many of them. 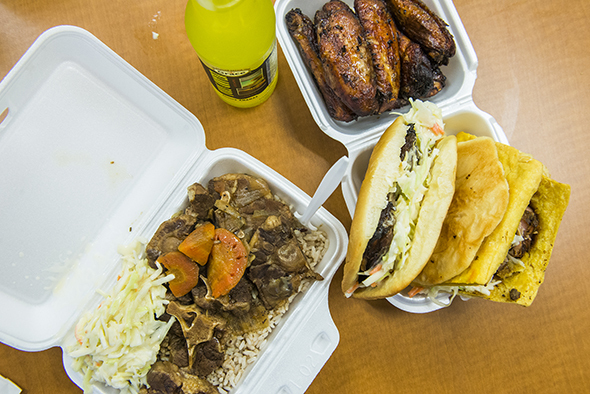 They just can't get enough of Allwyn's Bakery's jerk chicken.